The Tuesday market offered up a beautiful dorade royale, from St.-Jean-de-Luz. It is not that often that one really gets the chance to let what’s fresh in the market determine what’s for lunch. However, a Tuesday market day in Orthez, with no obligations and no plans imposing, offered just such a chance. 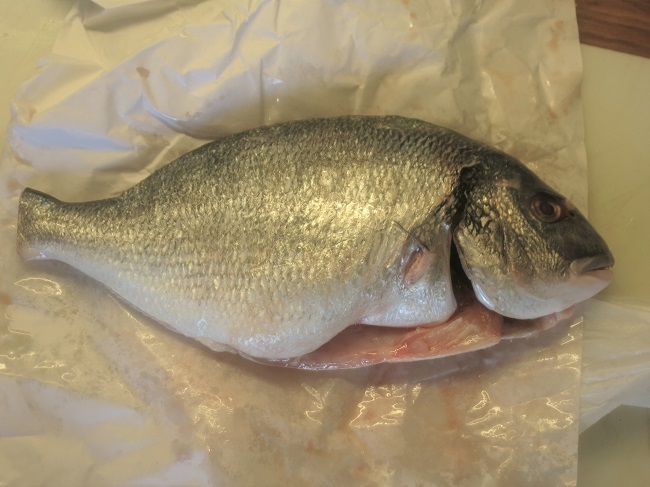 This Dorade Royale, also known as Atlantic Sea Bream, had the clearest eyes and reddest gills of all the fish on the stall at Poissonnerie Otano, a permanent stand in Orthez’s covered market. 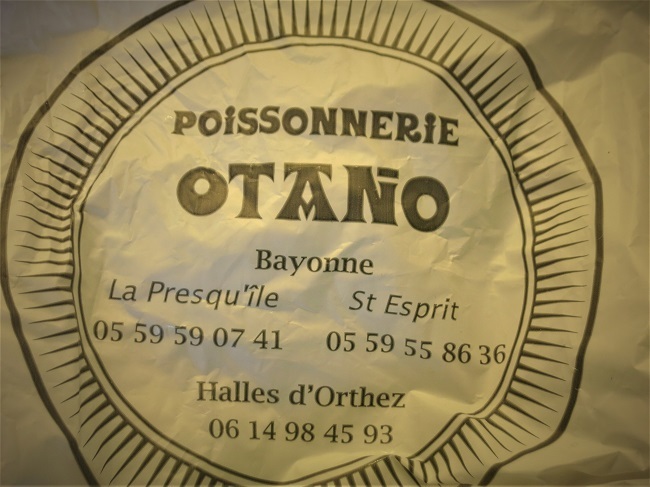 With stands in both Orthez and Bayonne, Otano is family owned by a Basque family that sources out of nearby Saint-Jean-de-Luz. Lets face it, there is no substitute for really fresh fish. 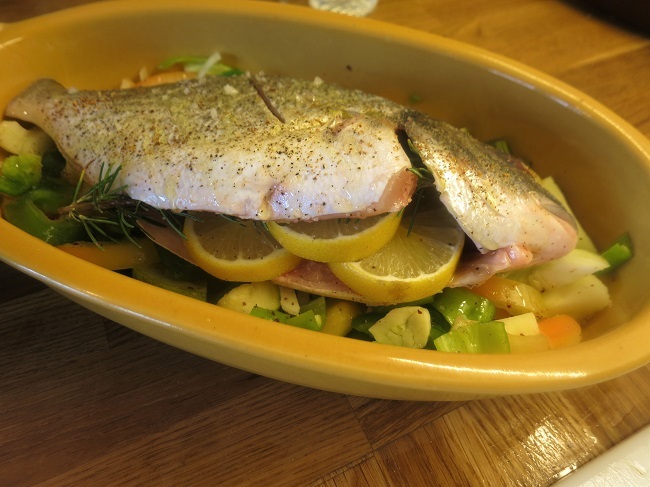 Rule 1: Make a flavorful bed of veggies to go under the fish. These will flavor the fish during cooking and will be served as a side dish. 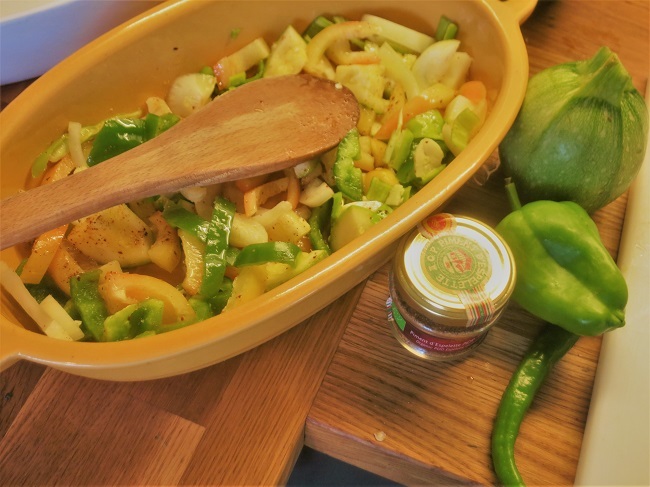 I had on hand peppers (both sweet peppers and the famous poivrons longs verts which are the ones the Basques prefer for making piperade) as well as some summer squashes, onions and garlic. Don’t forget to season the veggies with salt and pepper; I used a little piment d’Espelette. Also add a little liquid to the dish to prevent it scorching. Water is fine, but white wine, fish stock, even cider or beer will work well. Rule 2: Rub the fish inside and out with olive oil, the season it well with salt and pepper. Fill the cavity with things that will taste well with the veggies you have selected for underneath. 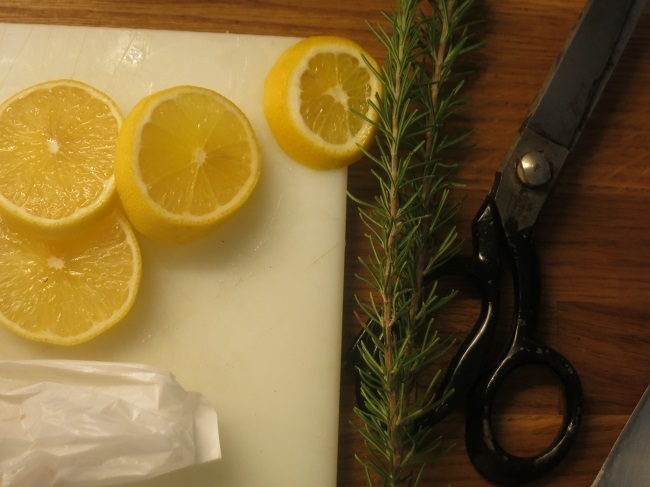 I used rosemary from the garden and lemon slices. Once stuffed, I just lay the fish on the veggies, no need to truss it up. Rule 3: Cook the fish for the right amount of time at the right temperature. The right temperature is pretty easy. I like to use 400 deg F, as this will yield a fish with crispy skin. Its that “right amount of time” is the kicker…Overcooking will ruin its delicate moistness, under cooking will mean trouble getting it off the bones. According to Richard Olney, author of the seminal cookbook Simple French Food, one should allow 10 minutes of cooking time for each 1″ of thickness of the fish in question, regardless of the cooking method (if you have read Olney, you will recognize in this advice his typical obliqueness when it comes to concrete detail and his fondness for sweeping generalities…don’t get me wrong, I love his work but his books are often more philosophy than cooking instruction). Although I think that this is a good guide, I find that when roasting fish on the bone, in a hot oven, it will be closer to 17 minutes. 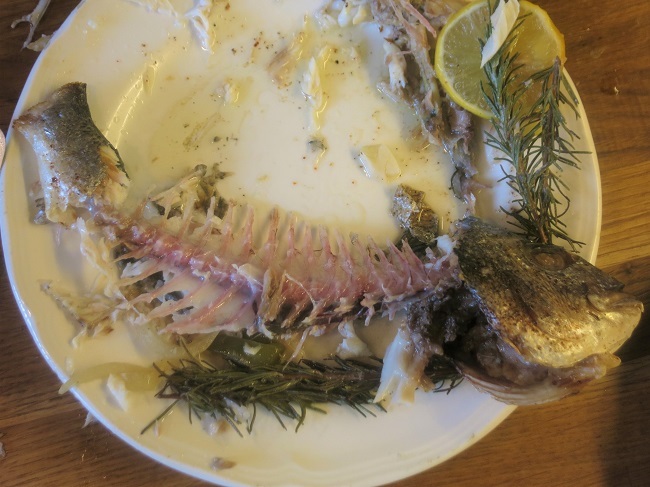 In any event, it doesn’t pay to rely too religiously on advise and but instead to verify that that the fish is cooked by flaking it along the spine with a small knife. If is just barely flakes, it is ready. Start checking before you think it will be done to avoid over cooking. Rule 4: Remember a nice appetizer to snack on while the fish is cooking. 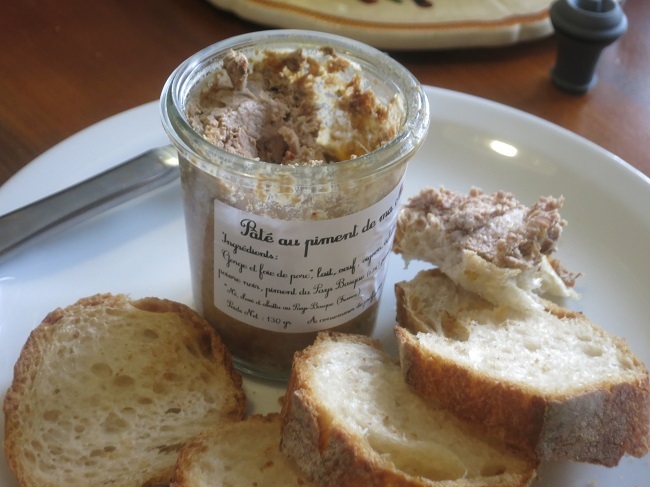 This is pork pate from famous artisan charcutier Eric Hospital…yummy! That’s about it. 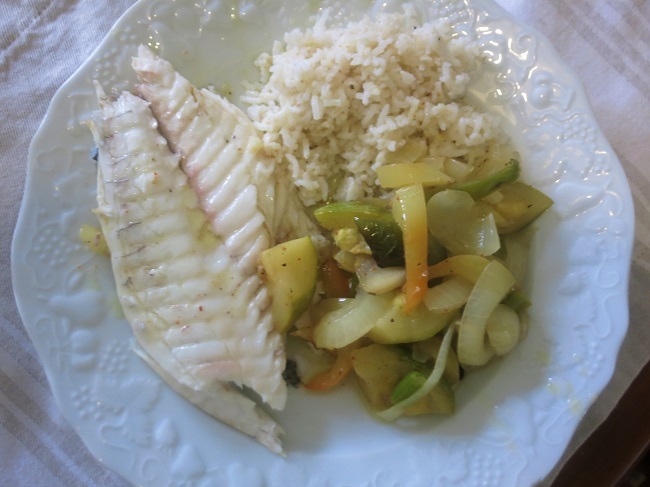 Once the fish is cooked, lift of the fillets and serve. Stir a couple spoons full of butter into the roasted veggies and pan juices and serve that with your fish. Add some boiled rice or quinoa and you are ready to go. Simple and delicious! This entry was posted in Stuff and tagged Charcuterie, Fish, Orthez, techniques, Vegetables. Bookmark the permalink.